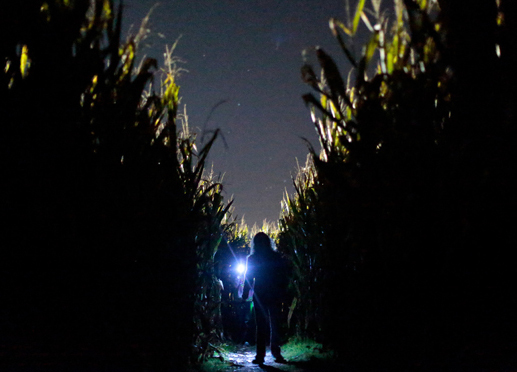 See the maze in a whole new light – by the light of the stars and a flashlight! While Mike’s Maze no longer offers haunted attractions, we have had many requests for our family friendly flashlight maze. We are opening this option to groups by special reservation only. For up to 15 people, there is a base rate of $300. Additional people can be added for $10 per person. Everyone in your group must arrive together at the reserved time. Our Maze Master will greet your group and explain the games in this year’s maze. Each member of your group will be provided with a flashlight. The maze will take about 90 minutes to navigate and find all the clues in the dark. Those who successfully solve the puzzles will win a prize pumpkin! Group Bookings will be taken during the hours of 6:00 pm – 8:00 pm on Tuesday, Wednesday, Thursday, and Friday during our season. To inquire about availability and make a reservation, please use our Private Parties Form.